Flip Out, the UK operator of trampoline parks, is to add a 20,000sq.ft inflatable theme park to its location in Rutherglen, Glasgow. The facility will feature a two-lane assault course, inflatamaze, large ball pools, a jelly mountain and giant bouncing balls. Catering for the younger guests will be a dedicated area for under-fours with slides and ball pools. 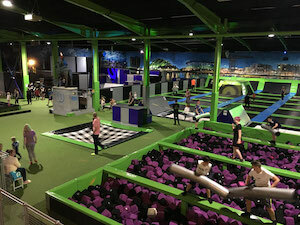 The attraction, which already claims to be the biggest in the world with 63,000sq.ft of trampolines, has been open since 2017 and hopes to have the inflatable addition open to the public by the end of this year to complement its existing trampolines, ninja warrior course, parkour area, soft play and VR arcade.